ROSE Frost receives a bracelet on her sixteenth birthday, a parting gift from her mother who claims it is a family heirloom. From that night Rose starts having vivid dreams and strange visions. DAYS after, her family separate and Rose moves into her grandmother’s house. Rose remembers happy childhood holidays with her grandmother and is eager to rekindle her friendship with Hannah and Mira, the two girls she played with as a child. Rose’s dreams start to involve a woman called Halíka Dacomé. A legend or a figment of her imagination, she knows not, but her grandmother, Daisy, remains reluctant to talk it. DANGER strikes one night. Rose is first on the scene after she smells burning and discovers a car that has been purposely set on fire. She is convinced that the boy in her latest vision is inside the car. The mysterious Aiden Deverill pulls Rose to safety, but not before a window explodes and a ball of fire burns them both. She uses her secret healing gift to heal the scars and to all appearances remains unscathed. But Aiden is free from burns too and Rose doesn’t know why. She is drawn to his alluring smile, his gorgeous dark looks and hypnotising blue eyes, but as they get closer her friends warn her off claiming that he’s bad news. Rose tries to find the truth about Halika Dacomé and more about why Aiden is so disliked, but she soon gets drawn into helping her friends solve the mystery behind the missing Warminster townsfolk. The latest missing person is her new friend Jez’s father. During the investigation, she meets Morgan, a family friend of Daisy’s who lives in the cottage at the bottom of Daisy’s garden. He’s kind, funny and clearly devoted to her, but Rose finds out that his hatred towards Aiden and his grandfather, Ben Deverill, lies rooted in a shocking event that happened years before involving both families. For Rose, her new life is beginning but she soon realises that people are not always what they seem, and finds it difficult to determine who to trust. What she always believed to be a happy family and a friendly town soon turns on its head when she discovers that her family secret, Aiden Deverill and the truth behind Halíka Dacomé is at the heart of the whole conspiracy. From page one you’re sucked straight into the world that Alexandra has created and you’re captivated from the start. There’s a good mix of mystery, romance and suspense to the story but it also had great characters too, so all of those things made this book really enjoyable. The mystery that surrounds the book is one I really enjoyed too; I found that I was trying to predict everything that happened in the book, only to find out that I couldn’t predict anything. Alexandra definitely keeps you on your toes and it was definitely one that will keep you excited. After practically living beside my mailbox for weeks, I finally had Elemental: The First in my hands. Excited as I was, I hurried back home, opened the book and started to read. Alexandra May had me sucked into her story already at the first few pages and I knew right away that this was a book I would enjoy. Rose and Morgan were lovely together and I found Morgan’s story truly heartbreaking. I literally gasped out in shock when I found out what had happened in his past. I am so excited for the next book in the Primord series. Elemental: The First had a lot of information and history that had to be told for us to understand everything that was going on, but now that that’s been told, there’s not much left than an epic adventure filled with loads of action and surprises. I have a feeling this series will get better and better for each book and who doesn’t love that?! Elemental and everything about this book was unpredictable. I was amazed at how the writing immediately drew me in. It was neither boring or blah if you know what I mean. It was written with the right amount of detail and creativity from the author. She showed confidence and determination in her writing and that’s exactly the kind of feel each book needs to have. Confidence and Determination. This was a new reading experience for me. 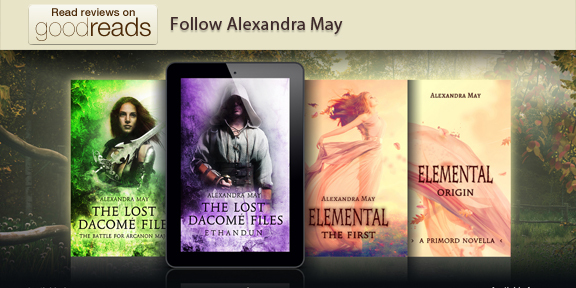 Alexandra May has a wonderful perception of writing and is gifted with such a beautiful talent. She’s managed to write with an easy flow words and a strong plot and amazing characters that will turn into a magnificent series that will surely spread worldwide like wildfire. Teens will surely love this read. Awesome book! You must read it! 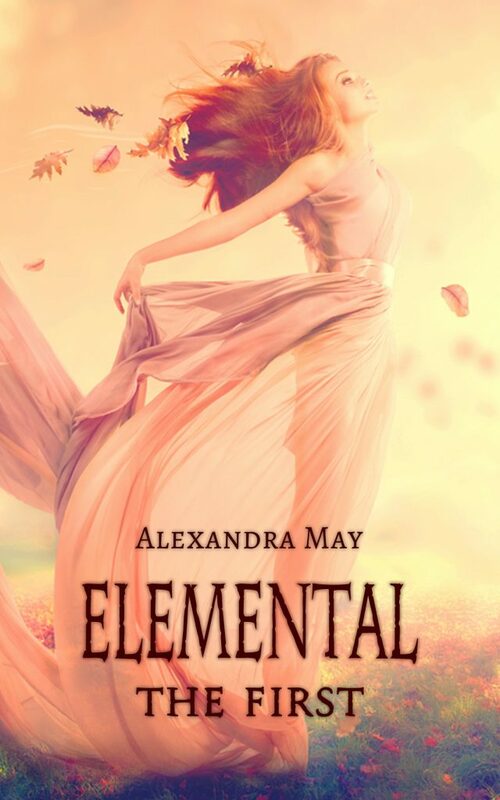 I liked Elemental: The First it was filled with suspense and I was constantly trying to figure out what was going to happen next. Elemental: The First gives a lot of background information of the characters and the town. Normally, I find too much detailed information and not enough action to bore me but Alexandra had a perfect balance between the two. Wow! What a surprise ending. I loved this book, it kept me going further and further into the story. The story had a good pace that wasn’t bogged down with to much romance. It’s a very good read and I can’t wait for the next book. My hats off to Alexandra May. This is a tale full of mystery and intrigue, by the end I was wondering just who Rose could trust. It’s heavy on the description at the start but by the end Alexandra seems to have found a nice balance between setting the scene, character interaction and plot development. The whole book has set the scene for the next one and I’m looking forward to seeing how the story develops and joining Rose on the next part of her journey.